Gain a better understanding of the top modalities in massage practice with expert insight and a balanced, user-friendly approach! 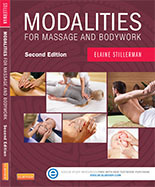 This current, consistently organized resource distills a wealth of information on 23 popular massage modalities into easy-to-read overviews detailing the essential principles behind each therapy. Identify the modalities that best apply to your clients, incorporate key concepts into your practice, and take the first steps toward specialization all with one helpful text! Mosby Publishing © 2009 $73.95 ISBN: 978-0-323-05255-9. This complete guide to all aspects of prenatal, labor, and postpartum massage, with a foreword by Penny Simkin, provides you with details on the intricate anatomy and physiology of pregnancy, as well as appropriate massage techniques to focus on the special needs of the mother-to-be as her body goes through the dramatic changes of the childbirth experience. It includes the fundamentals, techniques, preparation, prevention, and treatment of common problems. The wide variety of bodywork techniques, including Swedish massage, acupuncture points, myofascial release, triggerpoint therapy, lymphatic drainage, and reflexology, will help you provide expectant and new mothers supportive and nurturing care. "...(an) engaging, captivating and extremely detailed resource. This work is an authoritative volume that remains accessible to readers. 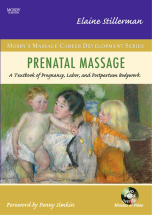 Both experienced pregnancy massage therapists and students would be well advised to pick up a copy." Mosby Publishing, 2008 $62.95. ISBN: 978-0-323-04253-6 . MotherMassage is a beautifully illustrated guide to help eliminate some of the common discomforts fo pregnancy. Designed to be used either alone or with a partner, MotherMassage provides techniques for a variety of massages, including full body massage, preparation for labor and birthing massage, massage during postpartum and nursing stages, and infant massage. These techniques are explained in step-by-step, illustrated detail. Also included are sections on reflexology, herbal remedies, and nutritional requirements for pregnant and lactating women. "Elaine Stillerman's book on mother (and father) massage is a very interesting and contributive set of ideas. Bravo!" "I was particularly interested in Elaine Stillerman's book on massage during pregnancy, because being a physical therapist and masseuse myself, I think it is a good guide to help women make their pregnancy more comfortable through well-proved massage techniques." "Educators, doulas, and midwives can enhance their practices with knowledge and use of appropriate massage. It's a treat to study (Stillerman's) techniques in this handy, useable form." "Stillerman's clear and concise writing style, along with the easy to follow illustrations, make this a fun and informative book to read." "Expectant couples can look to this book for techniques and advice on relieving the discomforts of pregnancy through massage. Therapist Stillerman specializes in pregnancy massage and her expertise is evident. She begins with a chapter alphabetically listing the common discomforts of pregnancy, then carefully explains the proper use of massage for each situation. Besides massage, she also advises on herbal remedies and nutrition for pregnancy complaints, on preparing the body for labor, on massage during labor, and on massage for baby and mother during the postpartum period. Throughout, she maintains a calm, relaxing tone that well complements the book's theme." Dell Publishing, 1992 $17.00. ISBN #0-440-50702-2. Available in most book stores. A 1990 study by Harvard Medical School revealed that an estimated one fourth of the American population sought the help of alternative health care practitioners and paid more visits to them than all primary care medical doctors nationwide. A reference for this growing trend, The Encyclopedia of Bodywork: From Acupressure to Zone Therapy explains the practice and history of over 250 different types of hands-on therapies, movement re-education systems, psychological techniques, and metaphysical practices that promote physical and emotional well-being. Useful for practitioners, clients, students and general readers, The Encyclopedia of Bodywork details where bodywork techniques come from, how they are performed, and what benefits they yield. It offers a comprehensive resource list of holistic health care in the United States and Canada and provides a brief bibliography for each therapy and appendices that cover state licensing requirements. The book also includes clear line drawings that illustrate important concepts or techniques. "Stillerman has written a comprehensive, easy-to-read handbook that should make a valuable contribution to the entire field. I highly recommend it." "The Encyclopedia of Bodywork is an invaluable one-stop information resource...This encyclopedia is a must for the individual who is curious about any of an amazingly broad range of information dealing with the field of bodywork." "The Encyclopedia of Bodywork is a landmark publication...an essential reference for the general public. I highly recommend it." "The strength of Elaine Stillerman's Encyclopedia of Bodywork is its great breadth... Readers will find...an enormous variety of approaches, old and new. This is a valuable reference for practitioners and clients alike." Facts on File, 1996, $19.95. ISBN #0-8160-3646-2.